This prayer worksheet answers questions common about prayer, and presents the Lord’s Prayer as an example of how we should pray. It also discusses whether God always answers our prayers the way we want. You can find many more prayer resources on our website. Don’t miss our lesson series on the Lord’s Prayer. Thank you. 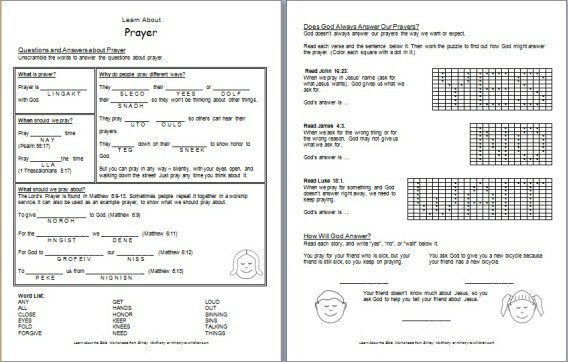 I was looking for something to do dealing with The Lord’s Prayer and these two worksheets will work wonderfully for them. Tony Kummer (Editor) reviewed & updated this page on : January 30, 2014 at 10:58 am. All our content is peer reviewed by our readers, simply leave a comment on any post suggest an update.